Palace Hotel near Marbella Ref 1077, there are very few places in the world that inspire such serenity and beauty as the surroundings of this hotel, located at the heart of the golden triangle: Marbella, Benahavis, Estepona. The 5-star luxury hotel, has been recognized by Seven Stars & Stripes with 6 stars. 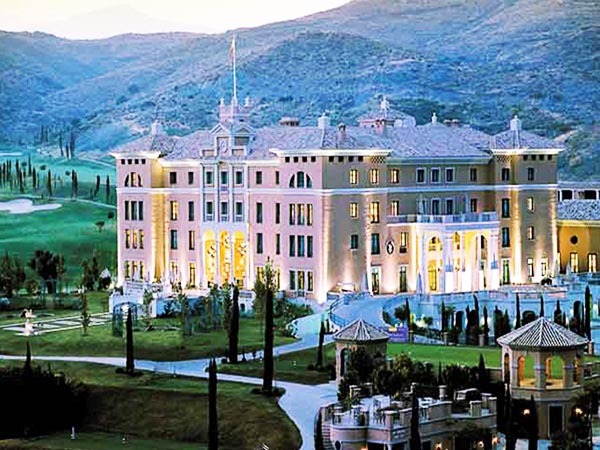 In addition, the hotel has been awarded “World’s best Golf Resort” by the prestigious World Travel Awards (WTA) event. Designed as a replica of a Tuscan palace, it offers 130 luxury rooms and suites including 9 villas with private pool; Guests find here a wide selection of unique experiences and facilities to choose from such as three 18 hole golf courses (Flamingos, Tramores and Alferini), a Medical Wellness Spa, a Racquet Padel Club, 4 Restaurants and an exclusive Beach Club on the Mediterranean shore.